In 1987 I started C.M.Baker Photography with a goal to provide quality photography service to the Delmarva area. Since then, C.M.Baker Photography has expanded and evolved just as the photography world has. From film to digital, and weeks to develop to instantly printing photos on site, C.M.Baker Photography has many services to offer today’s client looking for photography services. Printing photos onsite started about 10 years ago. We were able to capture the shot, take the card out and print out a 5×7 or 4×6 in about 45 minutes after the photo was taken. Boy, have things changed! For events, we now can take photos in front of a background or green screen with limitless choices, and have the photo print out in about 15 seconds. This is great for birthday parties, corporate events or fundraisers. We can even include your logo or text on the 4×6 or 5×7 image. With wedding packages, you will also receive 10, 8×10 photos printed onsite from earlier in your day that will be on display at your reception. Recently our onsite printing experiences have expanded even more as we now have two photo booths! We have a classic black, indoor photobooth that adds a fun experience for your guests to any event. We come to your event loaded with props and ready to have fun! Our second photobooth is inside of a 1969 Shasta Compact Camper and is perfect for your next outdoor event of any kind! We have had so much fun taking our Shasta Shutterbug all over the state and surrounding areas. 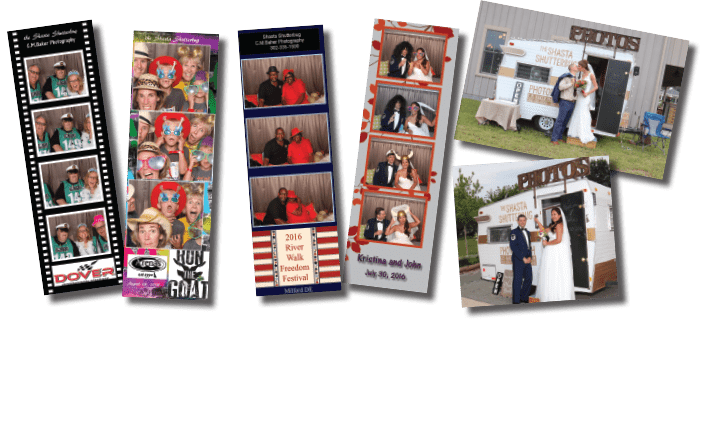 Upon reserving either photobooth for your event you are able to personalize your photo strip size, color and text. This makes a wonderful favor for guests to remember your celebration or providing advertisement for your business event. Something else that has emerged over the years? Social media! Social media and technology have become a huge part in today’s word. Website photos and head shots for your LinkedIn page or business website are an important part of today’s advertising. We have enjoyed coming into many local businesses and colleges and taking head shots for current employees or new graduates to help them start off on the right foot toward their career. In addition to the newer services being offered, we are still providing the classic wedding packages, engagement sessions and event photography. In 30 years, C.M.Baker Photography evolved just as the world around us has. Prices and more information can be found on our website www.cmbaker.com. Also check out our Instagram @c.m.bakerphotography and Facebook page. We can’t wait to be your photographer!